The Urban Redevelopment Authority (URA) of Singapore has launched a private residential site at Toh Tuck Road for sale via public tender yesterday (28 February 2017), and is set to draw strong interest from various property developers. This will be the first private residential land sale in the confirmed list – being offered under the Government Land Sales programme 1H2017. The 99-year leasehold Toh Tuck Road condo site has a total land area of about 201,517 square feet (sq ft) and has a maximum GFA (gross floor area) of approximately 282,124 sq ft. Located near the Bukit Batok Nature Reserve, the plot can yield an estimated total of 325 homes, with a maximum height capped at 5 storeys. It’s being mentioned by market watchers that property developers may be drawn to the manageable scale of the site and also its proximity to the nearby Beauty World MRT Station. Analysts are expecting the Toh Tuck Road condo site to be hotly-contested between 5 to 16 property developers as they seek to bulk up their land bank. Due to the relatively affordable quantum (probably less than S$200 million) and size of the subject site, more interest could be seen from mid-tier property developers. Market watchers have also given their thoughts on the estimated top bid – which should come in between the S$170 to S$200 million mark. It will work out to be approximately S$600 – S$650 per square foot per plot ratio (psf ppr). 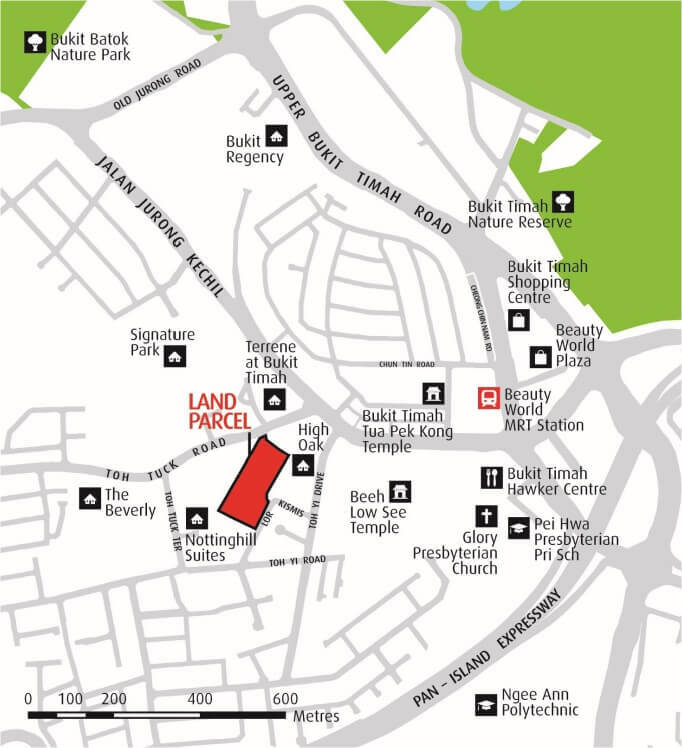 The last private residential site within the precinct to be launched for sale was at Jalan Jurong Kechil back in 2012 – which current sits The Hillford, a 60-year leasehold private development. Being noted by research consultants, the future new launch condo project at Toh Tuck Road will face very little competition due to the lack of supply within the area, and it is also being assumed that there are no en-bloc sales within the vicinity in future. The tender for the Toh Tuck Road condo site will close on 11 April 2017, 12 noon.